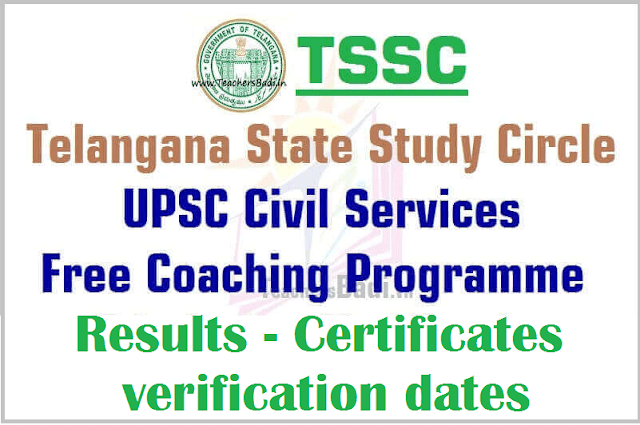 TS SC Study Circle Civils Free Coaching Results, Certificates verification dates 2018: TSSC TS Study Circle UPSC Civil Services Free Coaching Results, selected candidates list, Intimation Letter/call letter, Free Coaching admissions counselling, Certificates verification dates and list of documents details given here. TSSC TS Study Circle Director issued UPSC Civil Services #FreeCoaching Programme 2017/Civil Services Aptitude test(CSAT) Coaching Programme admissions 2017 Notification in June month applications are invited from the eligible SC, ST, OBC and Minority candidates belonging to Telangana 31 districts for admission into CSAT-2018 free coaching programme at Telangana State Study Circle Study Circle, Hyderabad for the academic year 2017-2018. Entrance exam was conducted on July 24 and results(Selected candidates list) have been announced on September 20. So, Selected candidates should download the call letter/Intimation letter and attend the counselling along with original certificates for verification as per given dates/schedule at below mentioned venue. Road No.14, Opp. KBR Park, Banjara Hills. 3. Latest Income Certificate issued by MRO (ending March 31st, 2017). 9. Disability certificate in case of disabled candidates. The selected candidates are requested to appear for counseling on the dates shown below at 11.00 AM., along with your hall ticket & above Original certificates. Scheduled Caste (SC) – Adilabad, Hyderabad, Karimnagar, Khammam & Mahabubnagar. Scheduled Caste (SC) – Medak, Nalgonda, Nizamabad, RangaReddy & Warangal. Rest of the selected candidates on 28.09.2016 (i.e.) All Scheduled Tribes(ST), Backward Classes(BC’s) & Physically Challenged Persons .